A lot can be said about the health benefits of air frying. Thanks to this invention, we are able to enjoy our delicious dishes of chicken, fries and whatever without thinking of oil or the problems that come with using it. 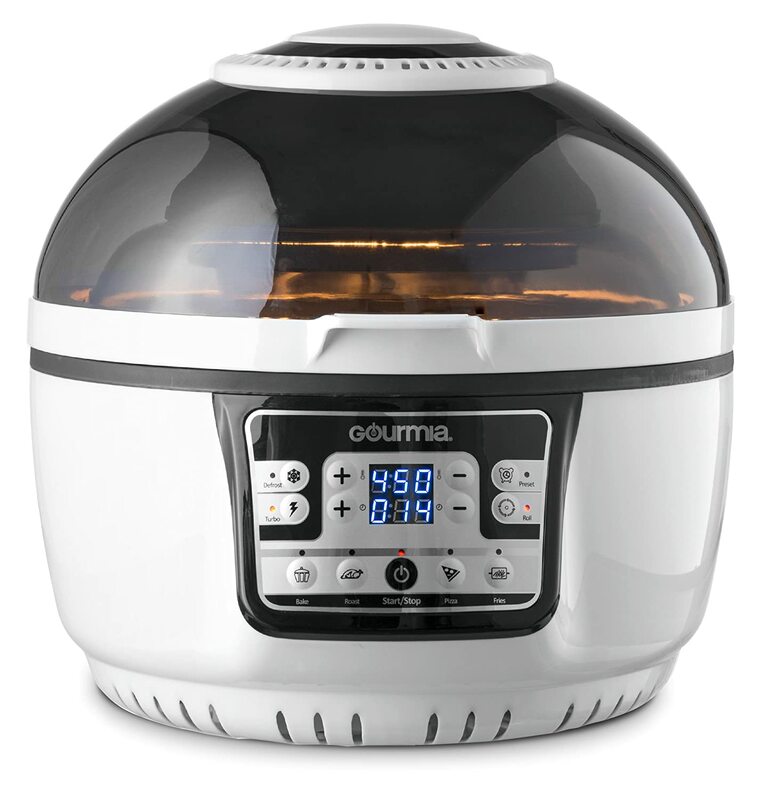 Forget the oil, the Gourmia Air fryer GTA 2500 would completely fry anything with only oil? Hell no, it does the miracle with air, precisely hot air. Apart from being able to do this, it can authoritatively lay claim to being the most versatile air fryer we’ve ever come across. Let’s get into the core of this Gourmia Air fryer review to see the beauty of life with the Turbo Air fryer. The Gourmia Air fryer is not just your regular air fryer. 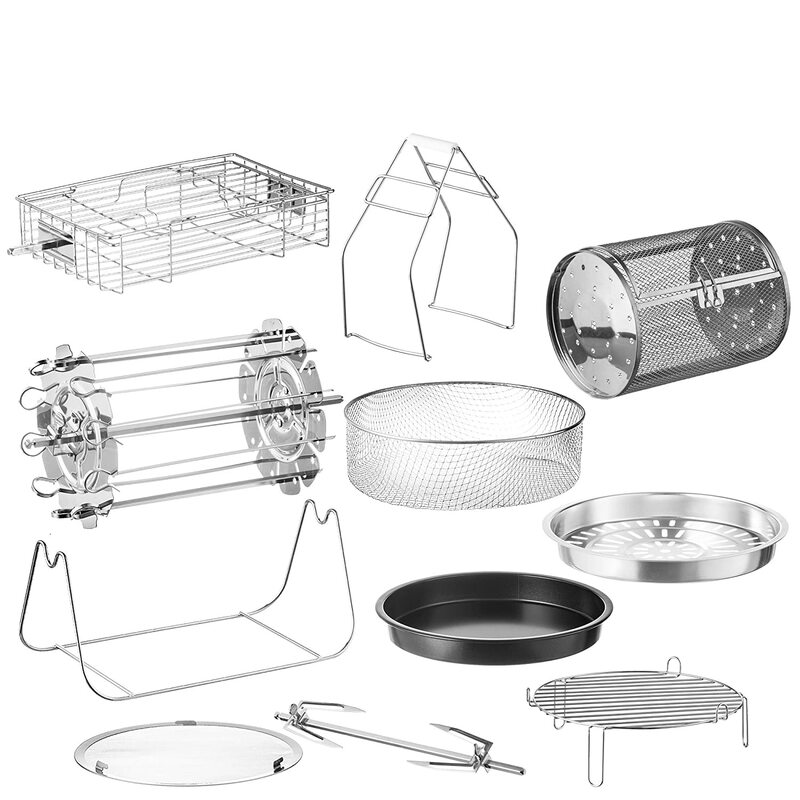 It is a serious versatile cooking with ten different cooking modes and comes packed with eleven different accessories. Now, that’s being serious. The Air fryer uses a sophisticated technology known as the 360degress Freefry Technology to air fry your foods. The technology involves the use of halogen bulb to heat the air in the fryer to be circulated around the food to be fried which in turn is also rotated at 360 degrees ensuring an evenly cooked final result. In looks, the Gourmia actually has the look of a spaceship, but only for cats! kind of funny, some peeps feel that way. It measures about 16.9 x 16.8 x 14.4 inches in dimensions and weighs about 20lbs. It is large enough for your family and even more and features Optimized Calorie Reduction Technology to safeguard you from excessive calorie intake most especially seen in deep frying. Why you need this? The question should be why you don’t need the Gourmia and we are yet to come across any tangible one at the moment. It is not often that you get an air fryer with the 10 different cooking modes. It is not often that you purchase an air fryer and it comes along with 11 different accessories for optimum use. Talk of the Optimized Calorie Reduction Freefry 360 Technology, you don’t find this around all the time. Really, one would think the question of whether one needs the Gourmia Air fryer is invalid as there are countless reasons and mind-blowing features that will bring the air fryer close to the heart of your kitchen. Let’s go deeper into these to check out the brilliant features in this exclusive Gourmia Air fryer reviews, you are definitely in for a ride. This technology is the basis of the operation of the Gourmia Air fryer, the technology uses halogen bulb to heat air that is circulated speedily in the interior with the food being rotated 360 degrees to ensure an evenly cooked final result. The Gourmia Air fryer is the king of versatility. It has ten different inbuilt presets with which you can cook over ten different food types. 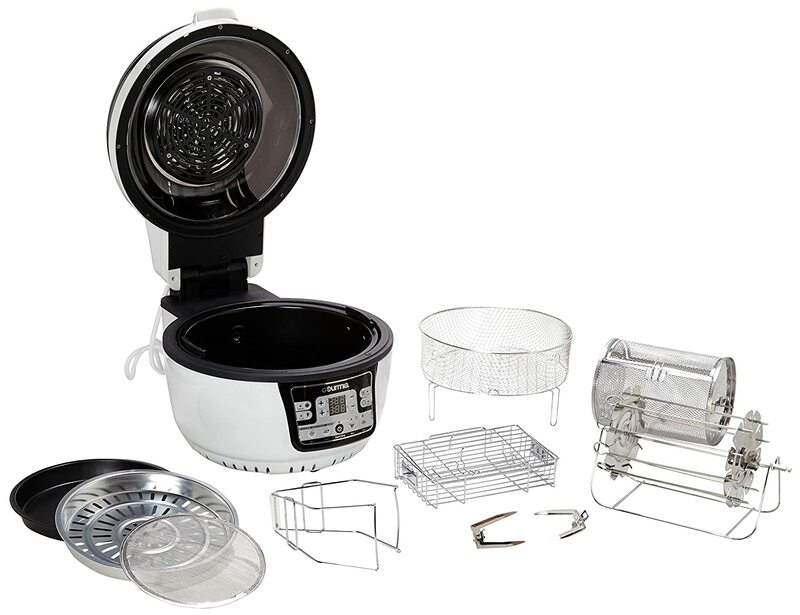 Along with air frying, you could bake, grill, roast, steam and cook in various ways with this master of versatility. You have the flexibility to choose from a temperature range of around 120F to an astonishingly high 450F. This is at the uppermost tip of air fryer temperatures and gives you a certainty that your meals are cooked perfectly and quicker, faster than deep fryers, faster than convection ovens. It has a whopping 9.5qt capacity. Apart from being more than enough for family meals, it could well be of help when preparing to host a party of several guests, you know that big is always almost better. The digital control interface is effortlessly easy to understand and use. Inputting in your settings is quite easy and practically cooking with the air fryer is a stress-free process. It features a retractable lid which can be easily opened to load and transfer food. The parts involved in cooking are coated with non-stick materials and are dishwasher safe. The air fryer has several inbuilt safety mechanisms, the exterior remains cool throughout the cooking time and the device has suction grips in the form of non-slip feet that prevents falling or slipping off surfaces. All the accessories are dishwasher safe and are made using non-stick coatings. Also, there is no involvement of oil, meaning there will be less mess from grease or splatter that could have been caused by the use of oil. Altogether, this makes the air fryer very simple and easy to clean without issues. Kabob rack and skewer rack. The Gourmia Air fryer can be very easy to use. Depending on what you plan to cook, you can load your food into the cooking pot or on some of the aforementioned accessories. This can be easily done by opening the lid and then loading in the food, closing it back on and then inputting your setting. Cleaning can also be done as all these accessories are removable and dishwasher safe. Enough accessories to suit whatever your cooking needs. So far the only thing worthy of mention is the lack of a cookbook. But it is something you can easily get with a little online research. The Gourmia Air fryer stands atop other air fryers, the price, though a little high up, is still fair considering the priceless benefits this guarantees. It is an investment that is worth it and you get nothing short of perfection with this spaceship-like cooker. While many air fryers just do the basics, the Gourmia takes things a little higher. It would definitely get all the attention if it ever lands in your kitchen, to enjoy air frying at its crispy and delicious best, the Gourmia Air fryer is one option you’d be wise to consider. Eat well and stay safe.